Antibiotics are powerful drugs used to treat bacterial infections and they typically work by killing or inhibiting the growth of bacterial cells. Between 1950 and 1970 many novel antibiotics were discovered and subsequently made their way into the clinic, revolutionizing modern medicine. Their success, however, comes with a price: many bacteria have acquired resistance to antibiotics and are therefore difficult or impossible to treat, resulting in a global health crisis. In Europe, approximately 25000 people annually die due to infections of multi-drug resistant bacteria, while in the United States about 2 million people are infected with antibiotic resistant bacteria of which 23.000 die each year (1). 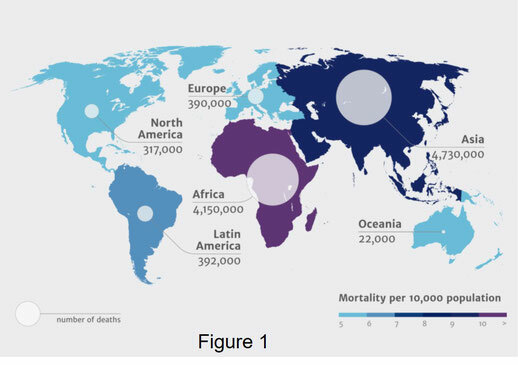 If left unchecked, it is expected that 10 million people die each year globally by 2050 due to increased antibiotic resistance (figure 1 adapted from 2). Additionally, the lack of newly developed antibiotics contributes to exacerbation of the current antibiotic crisis. However, the development of resistance is a natural phenomenon and the result of billions of years of evolution. In fact, metagenomic studies on uncontaminated samples from e.g. permafrost have established the presence of antibiotic resistance genes (3). This indicates that antibiotic resistance is ancient and occurs in the absence of human activity, although the current widespread (mis)use of antibiotics in human medicine, livestock and agriculture has dramatically increased the selective pressure for the appearance of antibiotic resistance (2). Bacteria can acquire resistance to antibiotics through different clinically relevant mechanisms (4). Firstly, some bacteria are naturally resistant because they lack the respective target. Antibiotics commonly target cell wall synthesis, protein production or DNA replication. If a bacterium contains, for example, another version of an enzyme involved in one of these processes that is normally targeted by an antibiotic it is naturally resistant to its mode of action. Secondly, resistance can be obtained via minimizing the antibiotic concentration in the cell. This can be accomplished through efflux or reduction of uptake/penetration. Genetic or posttranslational modification of the antibiotic target represents an additional mechanism of developing resistance. Finally, some antibiotics are enzymatically inactivated. Of grave concern is the development of drug-resistant Mycobacterium tuberculosis (MTB), the causative agent of tuberculosis in humans. Globally 1.7 million people are estimated to be infected with MTB and without treatment the mortality rate is about 70%. The global burden of infections with drug-resistant MTB was in 2016 approximately 490.000 cases with about 4% of new infections attributed to drug-resistant MTB (5). Tuberculosis is treated by a combination of two antibiotics, namely: rifampicin and isoniazid (6). Rifampicin is a member of the rifamycin antibiotic family. These were first isolated in 1959 from actinomycetes and it is well established that rifamycins inhibit bacterial RNA polymerase (7). Rifamycins are mainly active against Gram positive bacteria, while rifampicin, a semi-synthetic rifamycin derivative, displays potent activity against mycobacteria. Not surprisingly, rifampicin is the drug of choice to treat mycobacterial infections, including tuberculosis. Resistance against rifampicin can be obtained via distinct mechanisms. For example, mycobacteria typically develop resistance through point mutations in RNA polymerase, while other soil bacteria and pathogens rely on inactivation of this antibiotic by rifamycin monooxygenase (Rox). This enzyme represents an NADPH-dependent flavoprotein monooxygenase that was recently structurally characterized (8,9). This revealed a unique catalytic mechanism to detoxify rifampicin. Here I will discuss the biochemical and structural features of rifamycin monooxygenase. Rifamycins are a family of structurally related antibiotics of which some are naturally produced in the secondary metabolism of actinomycetes as polyketides by nonribosomal peptide synthetases. While other rifamycin antibiotics are obtained semisynthetically (7). These antibiotics are characterized by a 25-membered cyclic structure (figure 2 adapted from 6) in which an aliphatic chain (ansa bridge) connects two nonadjacent positions of a naphthalene ring (indicated by asterisks). Structurally, these antibiotics adopt a basket-like conformation that is essential for binding to its target. Rifamycins are active against a broad range of Gram positive bacteria, while most Gram negatives are insensitive because these antibiotics are unable to efficiently cross their thick cell wall. 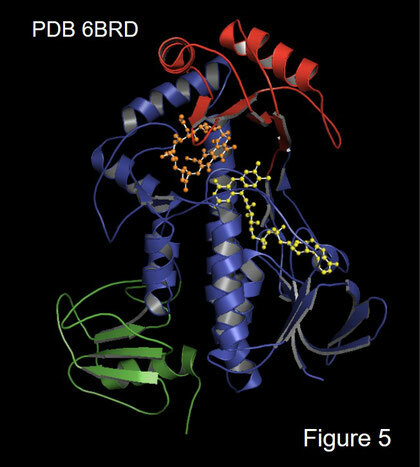 It is well established that rifamycins inhibit bacterial protein synthesis by binding to the β subunit of prokaryotic RNA polymerase, while showing no affinity for human RNA polymerase (6). The first rifamycins were isolated in 1959 from fermentation cultures of Amycolatopsis mediterranei (7) and these included rifamycin SV, which was the first rifamycin to make its way into the clinic in 1963. Through strain engineering other rifamycin variants could be obtained. However, many naturally produced rifamycins display only modest bactericidal activity. This inspired the synthesis of rifamycin derivatives with improved pharmacokinetic properties such as rifampicin and other clinically relevant variants (figure 2). Rifampicin displays potent activity against many Gram positive bacteria as well as mycobacteria. It is therefore the drug of choice to treat mycobacterial infections, including tuberculosis. Unfortunately, mycobacteria readily develop resistance against rifampicin and its therefore typically used in combination with other antibiotics such as isoniazid (6,7). Despite initial rifamycin sensitivity of many pathogens, endogenous resistance against these antibiotics develops at a high rate. This is primarily due to mutations in rpoB, the gene encoding the β subunit of RNA polymerase. Worryingly, these mutations confer resistance to most, if not all, clinically used rifamycins. Insensitivity against rifamycins is in MTB also mainly attributed to mutations in rpoB. Although modification of rpoB is clinically the most common mechanism of rifamycin resistance, other strategies to inactivate these antibiotics have also been reported. For example, other bacteria including important pathogens employ an enzyme, rifamycin monooxygenase (Rox), to detoxify these antibiotics. This is an NADPH-dependent flavoprotein monooxygenase of about 51 kDa. Likewise, tetracycline antibiotics are inactivated by similar enzymes known as tetracycline destructases, although these flavoprotein monooxygenases are unrelated to Rox. The physiological function of Rox is not clear and phylogenetically the enzyme is unrelated to known flavoprotein monooxygenases. The overall reaction of Rox with rifampicin is shown in figure 3 (top right panel adopted from 10) and involves linearization of the macrocyclic substrate through hydroxylation at C2. 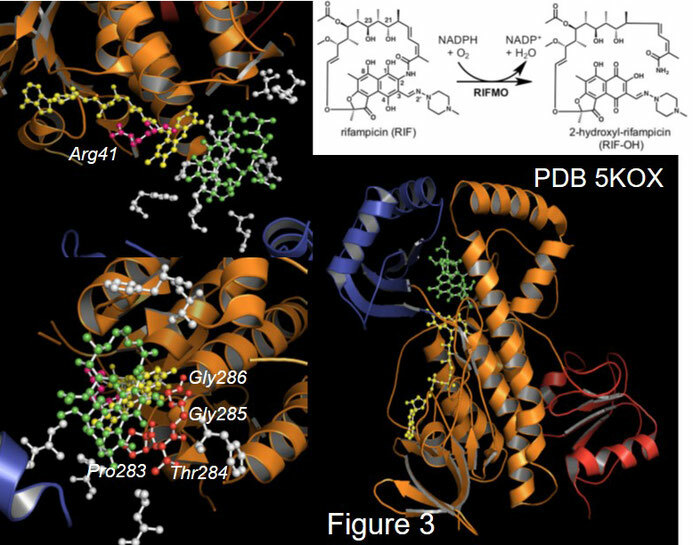 Recently, high resolution structures of Rox bound to FAD and rifampicin from Nocardia farcinica and Streptomyces venezuelae were determined at 1.8 and 3.3 Å, respectively (8,9). N. farcinica Rox is homodimer in solution, whereas the structure of the monomeric enzyme is shown in figure 3 (8), revealing that the enzyme comprises three domains (bottom right panel), namely: a FAD binding domain (in orange), a middle domain (in blue) and a C-terminal domain (in red). FAD is in yellow ball and sticks and rifampicin is in green ball and sticks. The FAD binding domain is made up a three helix bundle and a central five stranded β sheet, resulting in a β β α substructure. Moreover, this domain is also involved in dimerization. The middle domain is inserted in between the FAD binding domain and is folded into two β α β substructures. The middle domain is unique to Rox and caps the FAD binding domain, and thereby creating two openings that provide access to FAD. One of these is used for the accommodation of the substrate, while the other exposes the isoalloxazine ring as well as the ribityl and ADP moieties to the solvent (8). The C-terminal domain adopts an α/β conformation and is folded against the FAD binding domain. Although the function of this domain is not clear, it could be involved in proper folding and stability of the enzyme. 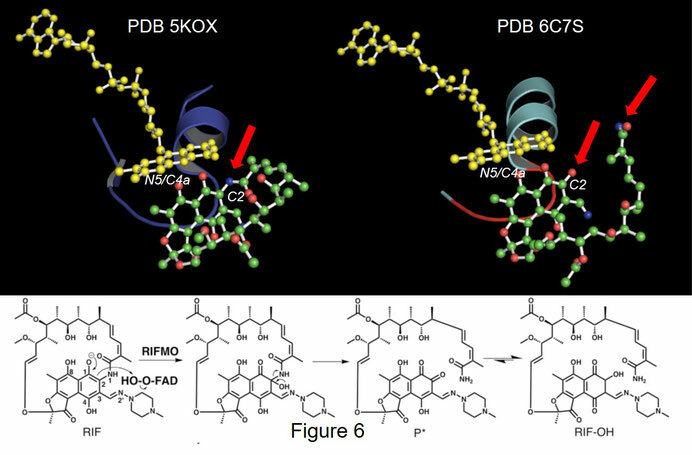 A close up of the FAD-binding site is presented in the left top panel and reveals that the naphthalene ring of rifampicin is perpendicular to the isoalloxazine ring of FAD. Moreover, FAD is oriented towards the substrate binding site in accordance with the “in” conformation. 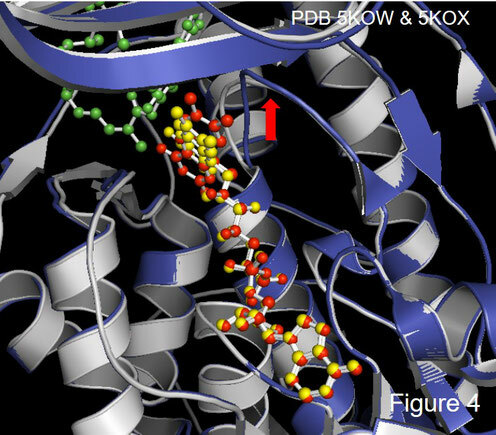 In contrast, in the “out” configuration FAD is pointed away from the substrate binding pocket with the nucleotide portion exposed. This configuration enables interaction with NADPH followed by reduction. Subsequently, FAD rotates into the “in” conformation, thereby pointing towards the substrate. Of particular importance is Arg41 (shown in magenta ball and sticks). This residue arches over the active site opening in the FAD-binding domain to interact with FAD and prevents movement of FAD. Conceivably, rotation of FAD is enabled by movements in the enzyme that also change the position of Arg41. A detailed view of the substrate binding pocket is presented in the bottom left panel. The rifampicin binding site is located in the middle domain and is relatively large and flexible. The substrate primarily interacts with non-polar residues (shown in grey ball and sticks) of which the Pro283-Gly286 loop (shown in red ball and sticks) interacts with the naphthalene ring. N. farcinica Rox was also crystalized with only FAD and a comparison of the structures with FAD or FAD and rifampicin is shown in figure 4. The structure in complex with both ligands is in grey with FAD in red and substrate in green ball and sticks. The FAD-containing structure is in blue with FAD in yellow ball and sticks. This reveals that in the presence of substrate the isoalloxazine ring is rotated differently relative to the structure devoid of rifampicin. Moreover, structural changes are also observed in the 280s loop that interacts with the naphthoquinone moiety (indicated by a red arrow). It is therefore conceivable that the structural changes in the 280s loop control the rearrangements of the isoalloxazine ring (8). Although the structure of N. farcinica Rox was the first to be reported, the 3D conformation of another bacterial Rox was determined at 3.3Å recently (9). This structure is shown in figure 5 and includes FAD (in yellow ball and sticks) and rifampicin (in orange ball and sticks) and reveals that, similar to N. farcinica Rox, the enzyme is composed of three domains: a FAD-binding domain (in blue), a middle domain (in red) and a C-terminal domain (in green). The substrate is located in the middle domain with its naphthalene ring oriented vertically towards the isoalloxazine of FAD. This redox cofactor is directed towards the substrate indicating that it is in the “in” conformation as observed in the crystal structure of N. farcinica Rox (8). The overall structures of the monooxygenases from N. farcinica Rox and S. venezuelae are highly similar and is therefore likely that both enzymes employ the same catalytic mechanism. Biochemical characterization of Rox with rifampicin showed that NADPH is only able to efficiently reduce FAD when substrate is present, suggesting that rifampicin binds before NADPH to the enzyme in the catalytic cycle (8). Profound insight into the catalytic mechanism of Rox enzymes was provided recently by structures of N. farcinica Rox in complex with FAD and the hydroxylated rifampicin product at 2.1 Å (10). Figure 6 shows the FAD-substrate (left panel) and FAD-product complex (right panel) in N. farcinica Rox with FAD in yellow ball and sticks and substrate or product in ball and stick representation with coloring according to element (green: carbon; blue: nitrogen; red: oxygen). Both structures reveal that the naphthalene moiety is located next to the N5/C4a edge of FAD’s isoalloxazine ring. 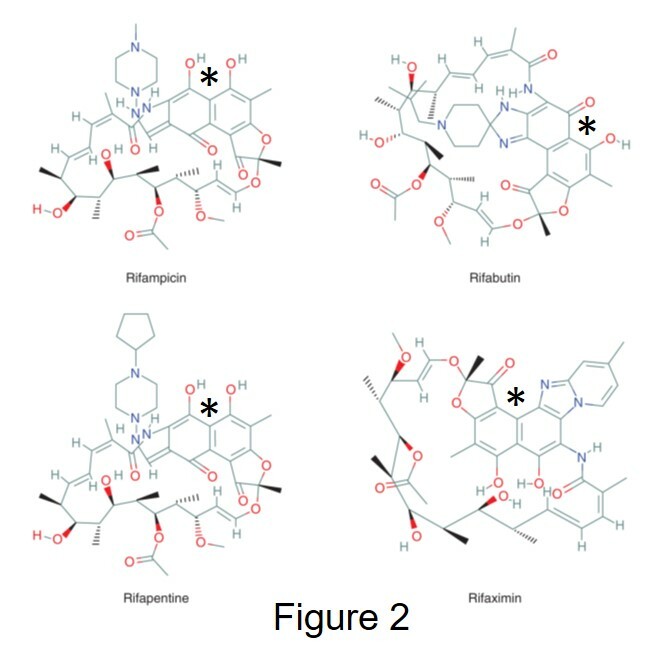 Whereas the substrate-containing enzyme (left panel) clearly contains rifampicin with its characteristic macrocyclic structure and ansa bridge, the structure with the rifampicin product (right panel) contains a linear molecule, suggesting that Rox converts macrocyclic rifampicin into a linear compound (figure 3 right top panel). Specifically, the structural data are consistent with a model (bottom panel) in which the C4a-hydroxyperoxyflavin hydroxylates C2 of the substrate (indicated by a red arrow) through a nucleophilic attack followed by cleavage of the ansa bridge by deamination of the ansa amide (indicated by a red arrow), resulting in linearization of the molecule (9,10). The linearized product is unable to bind to RNA polymerase, the target of rifampicin, and thereby explaining the inactivation of this antibiotic. Thus, Rox is a C-hydroxylating enzyme that cleaves the ansa bridge of rifampicin, which blocks of the drug to RNA polymerase. The current antibiotic resistance crisis represents a global health threat because it implies that, if not checked, many bacterial infections become difficult or impossible to treat. The main drivers of this crisis are the widespread (mis)use of antibiotics in human medicine, livestock and agriculture combined with the lack of newly developed antibiotics. However, the development of resistance is a natural phenomenon and the result of billions of years of evolution (3). Many soil bacteria possess genes that confer resistance to antibiotics and as a result of the increased selective pressure, due to the widespread use of antibiotics, these genes are transferred to other bacterial species. Consequently, antibiotic resistance spreads rapidly through the community. Several mechanisms have been identified by which bacteria can develop antibiotic resistance. Of these, modification of the drug target by, for example, mutagenesis and lowering the concentration inside the cell through efflux are clinically the most important resistance mechanisms. Nevertheless, detailed knowledge about emerging resistance mechanisms, such as enzymatic inactivation of antibiotics, is of key importance. For example, rifamycins are a family of structurally related antibiotics that include rifampicin and other clinically relevant variants. Rifampicin displays potent activity against many Gram positive bacteria as well as mycobacteria. It is therefore the drug of choice to treat mycobacterial infections, including tuberculosis. However, different soil bacteria and pathogens rely on inactivation of rifampicin by rifamycin monooxygenase. This enzyme represents an NADPH-dependent flavoprotein monooxygenase that was recently structurally characterized (8,9) and it can be expected that the detailed structural and mechanistic insight of these enzymes will fuel the design of e.g. inhibitors to counter the threat of this emerging resistance mechanism. 1. Prestinaci F, Pezzotti P, Pantosti A. 2015. Antimicrobial resistance: a global multifaceted phenomenon. Pathog Glob Health.109: 309-318. 2. O’Neill J. 2014. Antimicrobial Resistance: Tackling a Crisis for the Future Health and Wealth of Nations. Review on Antimicrobial Resistance. 3. D'Costa VM, King CE, Kalan L, Morar M, Sung WW, Schwarz C, Froese D, Zazula G, Calmels F, Debruyne R, Golding GB, Poinar HN, Wright GD. 2011. Antibiotic resistance is ancient. Nature. 7: 457-461. 4. Blair JM, Webber MA, Baylay AJ, Ogbolu DO, Piddock LJ. 2015. Molecular mechanisms of antibiotic resistance. Nat Rev Microbiol. 13: 42-51. 5. WHO Global tuberculosis report 2017. 6. Rothstein DM. 2016. Rifamycins, Alone and in Combination. Cold Spring Harb Perspect Med. 1;6(7). pii: a027011. 7. Floss HG, Yu TW. 2005. Rifamycin-mode of action, resistance, and biosynthesis. Chem Rev. 105: 621-632. 8. Liu LK, Abdelwahab H, Martin Del Campo JS, Mehra-Chaudhary R, Sobrado P, Tanner JJ. 2016. The Structure of the Antibiotic Deactivating, N-hydroxylating Rifampicin Monooxygenase. J Biol Chem. 291: 21553-21562. 9. Koteva K, Cox G, Kelso JK, Surette MD, Zubyk HL, Ejim L, Stogios P, Savchenko A, Sørensen D, Wright GD. 2018. Rox, a Rifamycin Resistance Enzyme with an Unprecedented Mechanism of Action. Cell Chem Biol. 25: 403-412. 10. Liu LK, Dai Y, Abdelwahab H, Sobrado P, Tanner JJ. 2018. Structural Evidence for Rifampicin Monooxygenase Inactivating Rifampicin by Cleaving Its Ansa-Bridge. Biochemistry. 57: 2065-2068.